Fill bowl A with baby food for your Baby A and fill bowl B with baby food for your Baby B. Hold the bowl in one hand or place it somewhere that is easliy accessible while feeding. Dip the spoons into the bowls. Spoon A will go into Bowl A & Spoon B will go into Bowl B. Ensure they have the desired amount of baby food for each bite. Move the spoon to feed Baby A and then immediately over to feed Baby B. The spoons are far enough apart that the baby will only notice their spoon and food, enabling you to feed both quickly. Then refill the spoons and repeat until your twins are full. I am so happy that you followed your heart and let your inspiration lead to the development of a product that no doubt, will be a game changer for parents of multiples! Great product!! Worked far better than I thought it would. Thank you so much for helping me out. 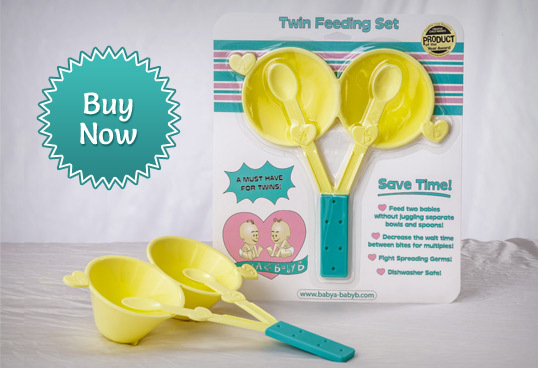 The Twin Feeding Set is a practical, time-saving tool for feeding two babies at once. A great gift for parents of multiples! Thank you for sending us the twin feeding set. It is a very clever concept! If you have twins you know that every minute counts, and when I used the twin feeding set, not only did it save precious time, but it also kept both my guys happy because neither one of them were left waiting too long for their next bite. I don’t know how I fed them before, the twin feeding set makes meal time so much easier, I would recommend this product to anyone who wants to save time and keep their kids happy.